Koh Samui News: Samui "song thaew" driver agrees to pay foreigner's 6,000 baht hospital bill after fare "misunderstanding"
Samui "song thaew" driver agrees to pay foreigner's 6,000 baht hospital bill after fare "misunderstanding"
A fight broke out between a group of foreign exchange students and drivers at Chaweng beach road on Koh Samui after the New Year countdown. 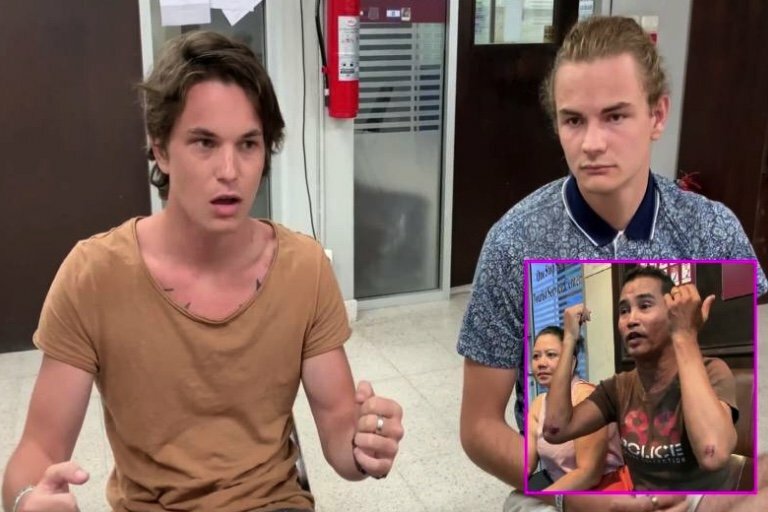 James Joshua Michael Fagin, 21, went to Pol Capt Daenchai Buntham of the Bo Phut police to say that he was attacked by a song thaew driver and several other male drivers after a disagreement over the price of a fare to Mae Nam. Mr Fagin, from South Africa, said that he was with three others including his girlfriend. He said that the song thaew driver wanted to charge them 800 baht per person. He laughed at this that annoyed the driver who attacked him with his fists. Seeing this five or six other public vehicle drivers joined in and he was knocked to the ground as fists and kicks flew, he claimed. The attackers then fled the scene as police arrived and Mr Fagin was taken to hospital where he was treated for his injuries racking up a bill of 6,000 baht. Shortly after making his statement to police the song thaew driver arrived at the police station. Wanchai Phoonsawat, 47, gave a different story. He said that he had offered an 800 baht all-in fare for the tourists and having got no reply to his request he asked "How much then?". He said that he was attacked by the tourists who started it. He said that two Thai women then grabbed him by the arms so that the "farangs" could punch him. "Thank goodness my mates arrived to help me out," he said as a melee ensued. He said that he was willing to let bygones be bygones but now the matter had been reported to police he said that he would agree to pay for the South African's hospital bill. Pol Capt Daenchai fined everyone for affray and noted that the song thaew driver agreed to pay the 6,000 baht hospital bill.